Thanks to a growing number of high quality studies, there is now a wide body of evidence to support the effectiveness of Chiropractic care on the treatment and management of both acute and chronic back conditions. Neck and Back pain can arise from mechanical problems in the spine, from slips or falls, whiplash injury, arthritis, postural issues or of unknown origin. 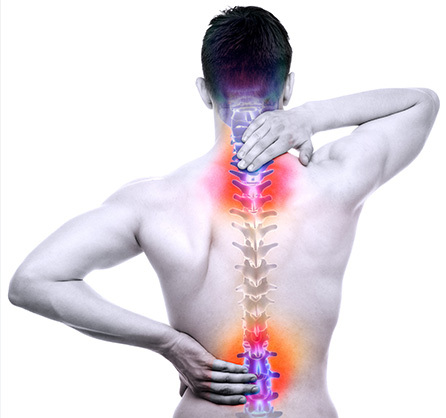 Pain in the neck or back can be caused inflammation of the joints, muscle spasms and from ‘slipped’ or herniated discs. Problems in the neck and low back can also be responsible for radiating or referred pain, pins & neddles and/or numbness into the arms or legs respectively. The chiropractor will undertake a detailed examination to investigate your symptoms and determine the underlying cause. Chiropractors are trained to take and interpret x-rays which may be required but if you have already had these done (or an MRI) please bring them to your initial appointment where possible.